I just recently found the perfect pair of wide-leg denim jeans! Out of all the great places to look for trendy jeans I stumbled upon this flattering pair: at Target! I mean, who can beat $24.00 for AMAZING jeans!? I've tried looking online for a pair of stylish wide-leg jeans and I even went to Levi's to see if I could make something work there. Unfortunately, I left the store empty-handed and a little crushed that I didn't find any in my size. Of course, as soon as I walk into my favorite local Target to make a return and plan on leaving with more money than I originally entered in with, and I find these jeans to try on. I saw a size 2 and decided to go for it. THEY WORKED! I was pleasantly surprised at the fact that these jeans ($24.00) are wide at the bottom, where they should be, and are tight at my waist. It was a done deal. I made my way out of the clothing department and checked out before I could pick up anymore unnecessary dollar section pumpkin decor, too. In the outfit look above, I am wearing a floral print tie-front crop top ($23.00) that instantly makes you look on-point for fall! I love the long sleeves of this crop top to balance out the midriff-baring aspect of the top. As for shoes, I opted for black loafers ($24.99), which are also from Target. What can I say? I have a problem entering Target and leaving with more than I anticipated! These loafers are a closet staple item for the fall, too. Let's talk accessories for a moment: these knot headbands are SO fun right now and I'm seeing them on bloggers across the country, from LA to NY. 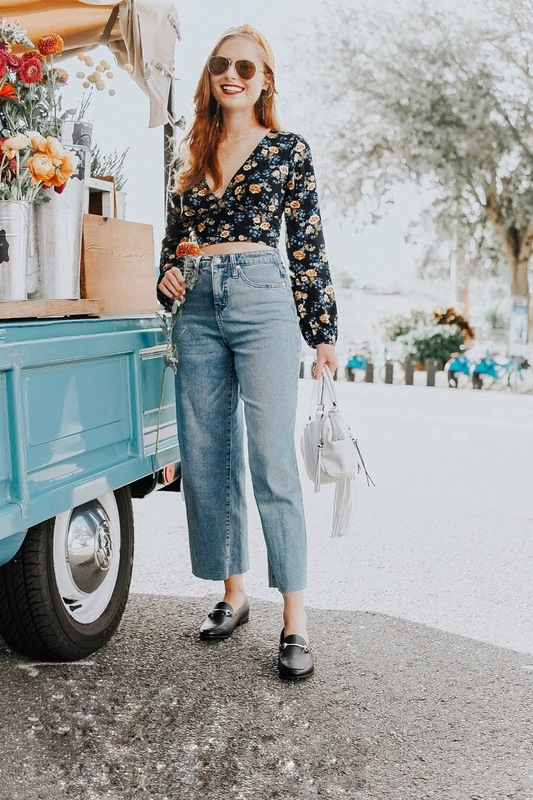 Some of my fave blogger babes like Steffy and Noelle rock this same mustard headband from Urban Outfitters in such a bohemian fashion that I constantly envy! Plus, it's only $14.00 so it's not too expensive if you want to test out this trend and purchase your own knot headband. BTW -- notice where I'm shooting this outfit? 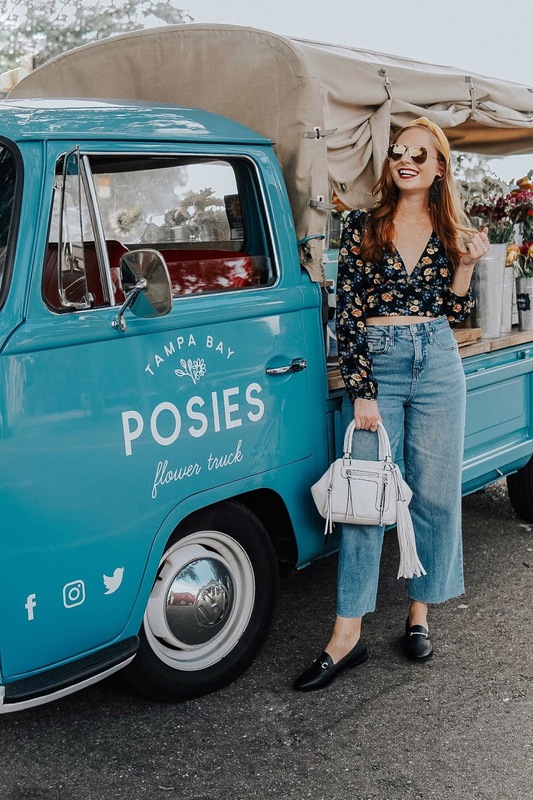 Next to the famous Posie's Flower Truck! This classic Tampa Bay Volkswagen travels from St. Pete to Tampa at local coffee shops and indie markets all the time. I found them hanging out at Bandit Coffee today (via Instagram Stories!) and caught them right before it was time for them to pack up and head out for the day (well, more like roll on out!). 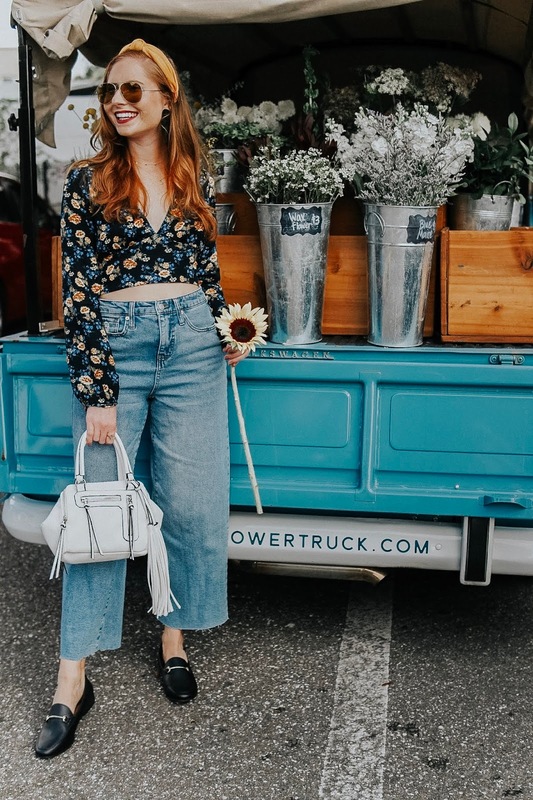 If you haven't checked them out yet, please give them a look over on Instagram because the ladies who own the truck are incredible #GirlBosses who opened up this mobile flower truck just last year. I always love supporting local businesses and visiting Posie's has become a fun tradition for me! Are you planning on wearing wide-leg jeans this fall? Let me know your favorite jean style in the comments below! I seriously am obsessing over the wide leg pant trend!